Cloud services hosted by Amazon Web Services, Azure, Google and most others publish the Service Level Agreement, or SLA, for the individual services they provide. Architects, Platform Engineers and Developers are then responsible for putting these together to create an architecture that provides the hosting for an application. Azure Traffic Manager: 99.99% or 'four nines'. SQL Azure: 99.99% or 'four nines'. 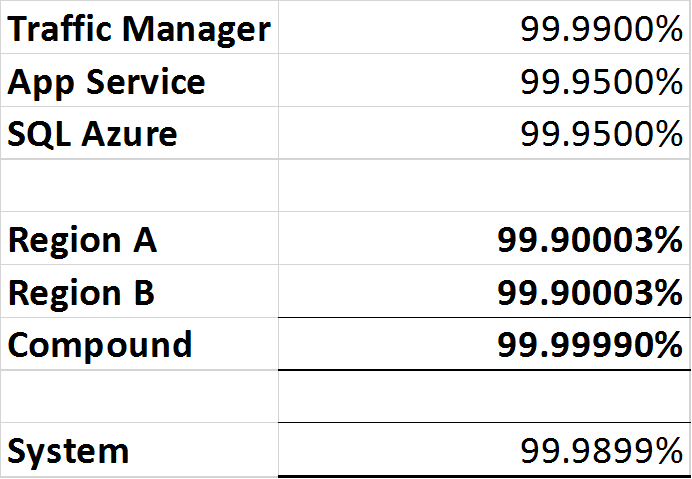 Azure App Service: 99.95% or 'three nine five'. 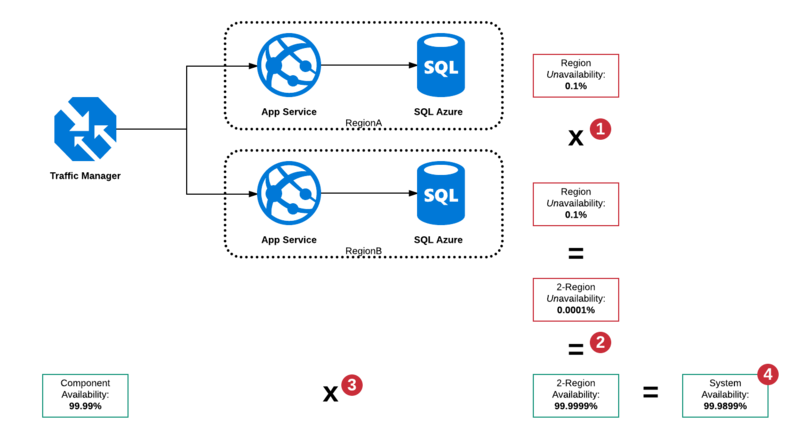 However when combined together in architectures there is the possibility that any one component could suffer an outage resulting in an overall availability that is not equal to the the component services. Both component parts are within their SLA but the total system was unavailable for 2 hours out of 24. Because Traffic Manager is a circuit breaker it is capable of detecting an outage in either region and routing traffic to the working region, however there is still a single point of failure in the form of Traffic Manager so the total availability of the "system" cannot be higher than 99.99%. How can the compound availability of the two systems above be calculated and documented for the business, potentially requiring rearchitecting if the business desires a higher service level than the architecture is capable of providing? If you want to annotate the diagrams, I have built them in Lucid Chart and created a multi-use link, bear in mind that anyone can edit this so you might want to create a copy of the pages to annotate. I'd take that as a math problem with the SLA being the probability of being OK. In this case we can rely on probability rules to get an overall. A simplification is the product of the first probability: 0.9995 * 0.9995 = 0,99900025. This is less than the worst case of 2 hours because there's a chance both are down at the same time. 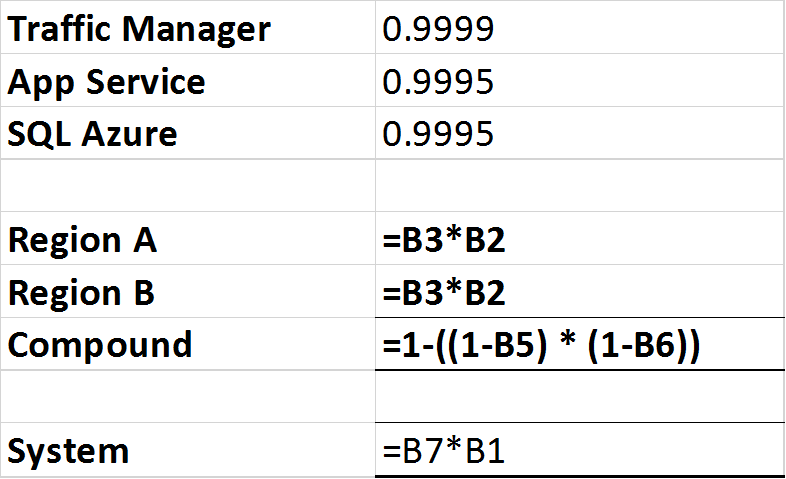 Now for your second case, we'll start gain from our compound probability for each region (Sorry I dismissed the change for SQL to keep it reasonable), assuming there's no independent probability for the region itself and that each region is isolated and as such a DB failure take only its region down. After reading Tensibai's excellent answer, I realised I used to be able to calculate this for network analysis purposes. I dug out my copy of High Availability Network Fundamentals by Chris Oggerino and had a crack at working this out from, not quite first principals. Multiply the unavailability of the two regions together. Multiply the Traffic Manager availability by the availability of the two regions. The result is the whole system availability. Not the answer you're looking for? Browse other questions tagged architecture cloud sla infrastructure or ask your own question. How should I separate micro service modules for the message part(posts, reply, private) of a social network? 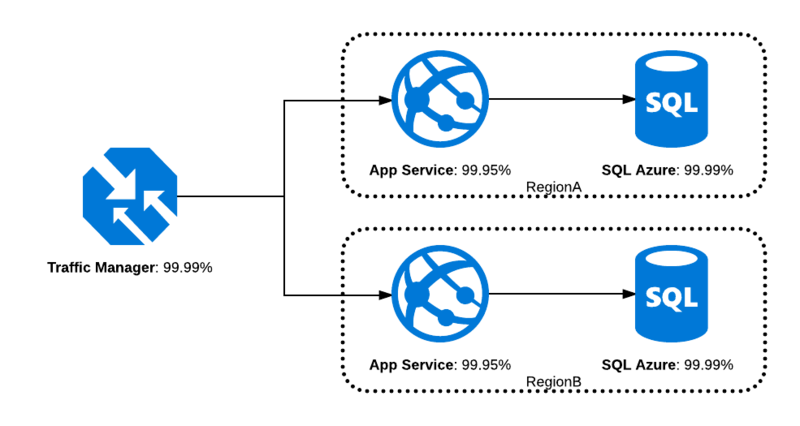 How to confugure proxy for Python Apache Cloud Stack client?